In the evening of 2 June 1995, Mayawati found herself living through the greatest horrors of her life. She, along with a few other Bahujan Samaj Party (BSP) leaders, had locked herself inside the State Guest House in Lucknow, while a frenzied mob of more than two hundred was trying to break the doors of her room from the outside. The mob was shouting abuses, promising to kill her. Many of her colleagues had already been physically dragged away by the mob. This nightmare went on for hours. Only the quick reaction of certain junior police officers at the scene kept the mob from breaking in. 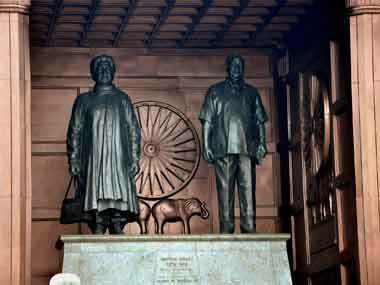 Mayawati remained inside the room late into the night, not knowing what was going on behind those doors. Only a few hours before the attack, she had pulled her party’s support from the Uttar Pradesh Government, collapsing Mulayam Singh Yadav’s Ministry. She has maintained, ever since, that the State Guest House incident, as it came to be known, was retribution for it. Eighteen years later, the courts have still to decide anyone’s culpability for the attack. The forty-eight hours before the incident had been momentous for Mayawati. On 1 June 1995, she had visited her political mentor and boss Kanshi Ram in the hospital where he was being treated for a brain clot. In his absence, Mayawati had been managing the party – a very important responsibility since for the first time BSP was in the government as junior partner to Yadav’s Samajwadi Party (SP). Kanshi Ram’s illness had her worried, for his death could mean a serious blow to the party at such a critical juncture. But Kanshi Ram was not dying; instead he had a surprise for her. “How would you like to the Chief Minister of Uttar Pradesh?” he asked her. Mayawati face clouded, as she assumed that illness had turned Kanshi Ram incoherent and delusional. But he insisted, explaining to her that he had made a deal with Bharatiya Janata Party (BJP). BSP will break the alliance with SP and form a new government in UP with support from BJP. Events then moved forward quickly, BSP pulled its support and the State Guest House incident ensued. A few hours after emerging from the guest house, she was sworn in as Chief Minister. At 39 years of age, a low-caste daughter of a postal clerk from Delhi, with no family connections or administrative experience, Mayawati had become Chief Minister of the biggest state in the country. Then Prime Minister Narasimha Rao called it “a miracle of democracy.” This was made possible by her burning ambition and drive, something she probably fostered from her resentment of the fact that her father always discriminated between her and her brothers. But her success was not hers alone. It tapped into something deeper that had been building up for a long time in the Independent India. For decades after the independence, Indian political landscape had failed to generate any political movement specifically centred around Scheduled Castes or other minorities. There had been some attempts, most prominent being BR Ambedkar’s Republican Party, but they consistently failed to take off. For the most part, minorities had remained a loyal vote bank for Congress Party. All this changed with the arrival of relatively-unknown activist Kanshi Ram on the scene. Kanshi Ram was low-level government employee in Maharashtra who conceived the idea of creating a political movement for the Backward Communities. In 1970s he created an activist organization called BAMCEF and then expanded the idea to a political group called DS-4 in 1981. Finally, DS-4 was graduated into a full-fledged political party BSP, in 1984. It was during his early years of activism that Kanshi Ram recruited Mayawati. In 1977 she was a schoolteacher living with her parents, preparing for the Indian Administrative Service. She had given a few political speeches and done some activist work. Kanshi Ram, himself just an upcoming leader, saw potential in her and convinced her to follow him into politics full-time. It was a point of consternation between her and her father, which eventually led to her moving out of the house and moving in with Kanshi Ram in his rented house. They lived together for many years afterwards. Despite the speculations, the two denied having any romantic relationship throughout their lives (which, in any case, would neither have been inappropriate nor relevant since they were both unmarried). 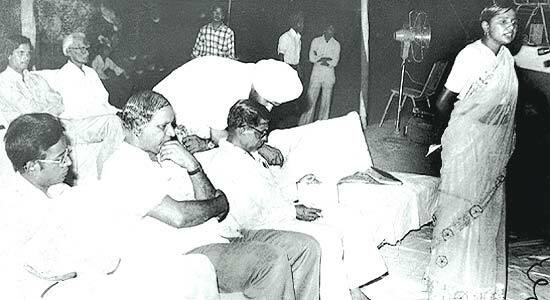 Regardless, physical proximity to Kanshi Ram allowed Mayawati a great deal of access and control. As his secretary/confidante/protégé, she had her finger on the pulse of the movement. Undoubtedly, her personal drive and energy also contributed to her rise in the party. By late 1980s, she had become the uncontested second-in-command of the party. A clear division of labour had emerged, where Mayawati concentrated on Uttar Pradesh, while Kanshi Ram concentrated on rest of the country. And while she was rising within the party, the party was rising in the country. Timing played a vital role in BSP’s success. Issues of caste and religion were heating up in the country with the Ayodhya issue, coupled with BJP’s spectacular rise. By then Congress had also lost its biggest secular icon – Mrs. Gandhi. Its passivity and reluctance to openly combat the juggernaut of Hindutva eroded the support from minorities even further. After Babri Masjid demolition in 1992, Uttar Pradesh was put under President’s Rule and political violence had become widespread in the state. The alliance was rocky from the start and fell apart in a couple of years. Kanshi Ram was already looking for more power. In the BSP’s thinking, power was far more important than the means by which it was acquired. In 1995, Kanshi Ram secretly engineered an alliance with the BJP, turning the caste politics on its head. In June that year, following the incident at the State Guest House, Mayawati became Chief Minister for the first time in her life. 2002, she became Chief Minister for the third time, for sixteen months. Undoubtedly, the instability of BSP governments coloured her governance style. If she was going to be in power for only months, her support base had to be rewarded quickly to ensure her next victory. BSP’s agenda to make Dalit identity dominant also had to be pursued aggressively. Her swearing-in ceremony was always followed by huge government hand-outs – jobs guarantees, loan waivers, land distribution and reservations – to her base and massive shuffling of bureaucracy to promote Dalit officers. This was invariably followed by rampant corruption and further divisions within the UP society. Along with Yadav, she became responsible for making UP politics an all-or-nothing proposition, where winning side was showered with rewards and losing side ruthlessly punished. More significantly, along with Yadav, she became responsible for emptying the state coffers with her open-handed populist schemes doling out hundreds of crores of rupees regardless of the state finance. Throughout 1990s, UP’s role in the national economy kept shrinking at an alarming rate, while the deficit spiralled out of control. By 2001, the state was paying 30% of its income as just interests on its older debts! When Kanshi Ram died in 2006, many people speculated that it spelled doom for Mayawati’s career. Instead, the coming years turned out to be her best. In 2007 elections, BSP won a clear majority in the state by achieving a strange coalition of Dalits, Muslims and Brahmins, the latter two being stolen from SP’s and BJP’s bases. For the first time, BSP was assured of a stable full-term. In many respects her fourth term was same as above. Corruption continued unabated, random transfers of bureaucrats remained highest in the country by a huge margin, populist government schemes and biased treatment of areas based on who they supported was persistent. But she also succeeded in delivering economic growth. Under her Ministry, UP economy grew by though not a spectacular nonetheless substantial 7%. In fact, it was this growth rate that she was banking on in the 2012 elections to return her to power. But as a common irony of history, her past politics had already sown seeds of her destruction. The state had already been so bitterly divided along caste and religious lines, that governance was never a factor in the elections. She was ousted from power by a electoral verdict that brought back her rivals Yadavs back to power, with even a bigger margin than she had achieved in 2007. 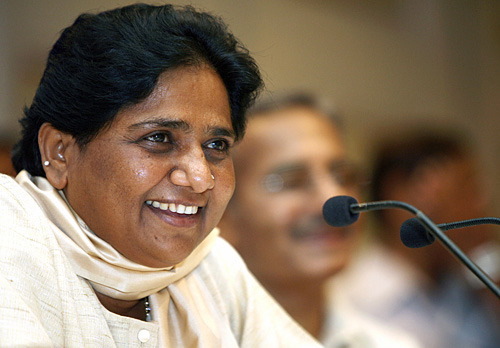 BSP still continues to be an important player in Indian politics, while Mayawati bides her time. While Kanshi Ram was alive, he had tried to turn BSP into a national movement, while Mayawati tried to focus all its energy into UP politics. Now, after having been branded as a regional party, BSP is trying to assert itself as a national one, contesting elections all across India. It remains to be seen whether Mayawati or someone else is able to make Dalit politics a national phenomenon in coming decades. If BSP is successful, it will push Congress further into a corner, taking away another one of its all-inclusive vote banks. Already besieged by many other rivals drawing the line on caste or communal basis, Congress may be forced to look for another strategy. That will change the shape of India political landscape forever. This entry was posted in Leaders, Regional Politics and tagged biography, dalit politics, mayawati, mulayam singh yadav. Bookmark the permalink. How significant do you consider the event when she came celebrating out of the parliament after failing the 13 day government of Vajpayee? Thanks for great information I was searching ffor this information for my mission. It’s a very informative data..should be shared with every davit.